This is my most favorite time of the year, because I just love going to the beach or swimming in pools. It's also my favorite season bec. we get to eat a lot of fresh fruits and veggies like mangoes, undoubtedly still the sweetest in the world, strawberries, cantaloupes, watermelons, while my veggie fix comes from the salads (lettuce in all shapes and sizes, and arugula). Summer also brings lots of end-of-season sales and one of the best ones I've been to so far is that of SCHU's BOGO (buy-one-get-one) SALE! I was at the TrinNoMa yest. and picked out two pairs of sandals, w/c will have their showing, of course, in the next beach I go to. Sizes were a bit buggy though. Like for the second pair I chose, a silver slipper w/ plastic gel-like thongs, I had to keep fitting the style from size 8 to 10, and in different colors, bec. the entrada was inconsistent esp. for the left foot. Surprisingly, while my right foot has always been the larger of my two feet, the left shoe of the style in question was always tighter at the entrada than the right. And while my feet are size 7.5-8, I ended up w/ a size 10 pair for this particular style, weirdly enough. For the orange pair of sandals above, fitting was not a problem at all. Fortunately both pairs were the same prices, at P1600, w/c meant I got two pairs for the price of only P800! If you choose two-differently priced pairs, you will just have to pay for the higher-priced one. It's all good. Promo is until April 4. Also, on the topic of shopping, maybe you want to have a guilt-free spree this time around? Well, PNoy Pinay is holding a YELLOW BAZAAR to raise funds for the Sen. Noynoy Aquino and Sen. MAR Roxas, presidential and vice presidential candidates, respectively of the Liberal Party in the May 2010 elections. The event will be on Saturday, March 13, from 10 am to 4 pm on the 3F/ Matrinco Bldg., 2178 Pasong Tamo, Makati. "Funds will go to help defray costs for our poll watchers on election day, and the days after, to guard our ballots," according to the SMS I received yest. Hope to see you there! Stand and be counted. 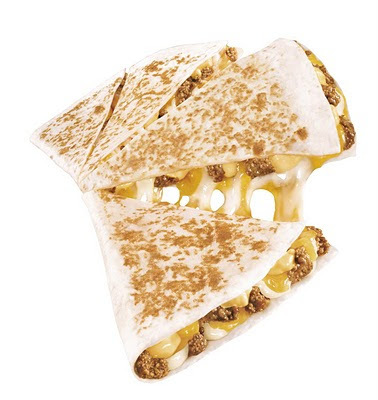 And speaking of good eats, TACO BELL has just come out with a smashing quesadilla, the cheesiest and beefiest ever! I attended the restaurant's recent press briefing (although I was very late, meaning the press had all left haha! ), and got to try Extreme Cheese and Beef Quesadilla! For P109 you get this amazing meld of cheddar, mozzarella, and Monterey Jack cheeses squishing so sinfully with the bed of beefy goodness. You know I'm not a fan of fast-food dining, but in this case, this quesadilla was a winner for me! You can have some nachos and a 12 oz. softdrink or iced tea to go w/ your quesadilla for P189. It's value for money as well as the quesadilla is served in a 10.5-in. diameter flour tortilla, so it's good for sharing. But in my case, of course, I devoured the entire thing all by myself. Wotta pig! Oink! Another new Taco Bell offering is the Crispy Potato soft taco, w/c costs about P39. As the name implies, it has chopped potatoes, fried to a crisp w/ some light flour coating, some lettuce and cheddar cheese, gently sitting in a soft taco shell. While it was an interesting play of textures, I thought it just had way too much carbohydrates wrapped in that thing. I asked the manager why they used potatoes and not experimented w/ let's say tofu instead, she said that they had to follow the U.S. menu. Sayang. That would probably have been a hit w/ the health conscious among us. Taco Bell, call me. Anyhoo, this taco variant is the resto's offering for the Lenten season, so those who are religious, will hopefully feel closer to God after eating this. Or your gym trainer. Ach. Mind the waistline girls!